El Valle, Panama, near the El Chorro Macho. Tried to do a three point turn at the top of a hill, realizing we were lost. 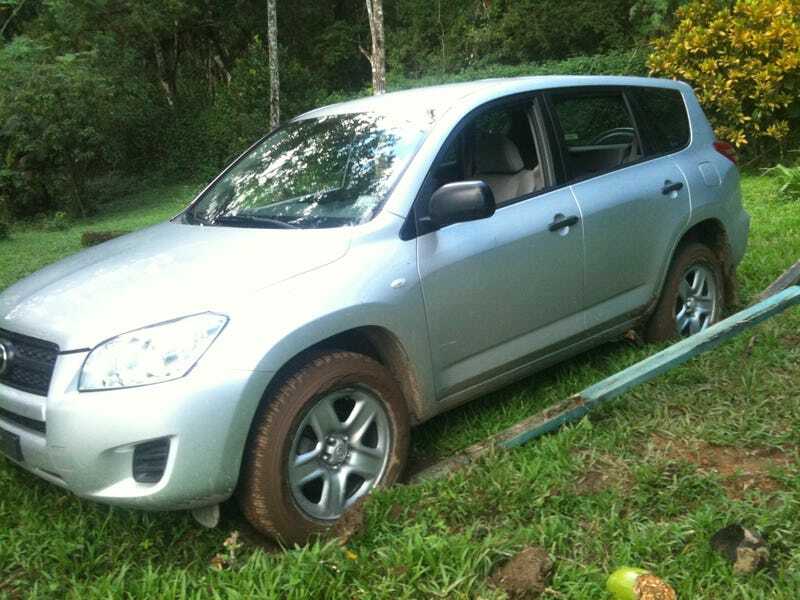 Rental Rav4 slid down the hill into a jackfruit grove, about 30 feet down a muddy hill. Found some scrap wood outside what I thought was an empty house, and tried to use that for traction. No dice. Young kid comes out of the house, I scramble “Por favor, ayudame” and he comes out with a shovel. Perfect! I then break the shovel. We go down the hill toward town, seeking una grua or perhaps the police who can find a way to tow us back up the hill to the road. The police informed us they would not even attempt to get a truck up that hill. Mind you, I am with my now-wife and my now-mother-in-law as we were on a trip to scatter my wife’s recently-passed father. And now I have stranded us and our car in a remote part of Panama. Hours pass. Some curious townfolk passing by start gawking at our situation. More time passes. Suddenly, four very large young men show up. They all move to the front of the Rav4. “¿Tres?” “Sí,” i say, then count down and punch the diff lock button. Floor it in reverse, and we make it about 15 feet. One of them produces a huge rock from... somewhere... and shoves it under a front tire. They take 30 seconds. So the boy went back to town and returned with his brothers and cousins. And that’s how I got out of what I was quite sure was going to be me abandoning a Rav4 in the middle of Panama.